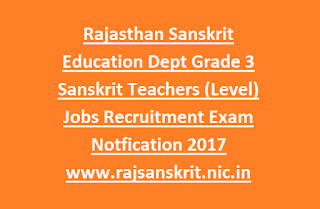 Senior secondary or equivalent qualification with at least 50% marks and Two years Diploma in Elementary Education D.El.Ed or 4 years Bachelor of Elementary Education B.El.Ed qualification from recognized University to apply for this Rajasthan Sanskrit teachers vacancies. 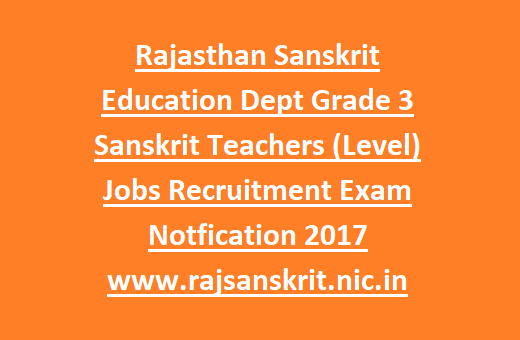 Willing Job seekers having eligibility criteria have to apply for the Rajasthan Sanskrit Teachers latest recruitment using the official web link www.rajsanskrit.nic.in from 14-09-2017. Maximum age limit to apply for Sanskrit Teachers vacancies is 35 years & minimum age limit is 18 years. Last for submission of complete application form is 13-10-2017 through online mode only. Incomplete applications will be rejected. Candidates will be offered scale of pay per month as per Rajasthan Govt norms. The recruitment selection of this Sanskrit Teachers jobs is based on merit of the candidate in qualifying examination. Important dates, Application processing method, Process of Selection, Age limits, Education qualifications of Sanskrit Education Department, Rajasthan Sanskrit Teachers (Class I- V) Jobs are mentioned below. Total Available vacancies in Rajasthan Sanskrit Education Department Recruitment are 1829 posts. Post name: General/ Sanskrit Teachers (Class I- IV): 1829 posts. Senior secondary or equivalent qualification with minimum 50% marks and Two years Diploma in Elementary Education D.El.Ed or 4 years Bachelor of Elementary Education B.El.Ed qualification from recognized University. Please check the Notification for Qualification details. Please check the notification for Age relaxation details. Candidates selected for these teachers jobs will be offer salary as per Rajasthan Govt rules. Please check the Notification for salary details. Selection for this teachers Jobs is based on candidate performance in qualifying exam. Eligible candidates with essential criteria for Teacher Level I Class I to V Jobs are required to submit application forms through online. Application forms available from 14th September-2017 from the Rajasthan Education Department official website www.rajsanskrit.nic.in. Last date for submission of application form is on or before 13-October-2017.